The humpback whale (Megaptera novaeangliae) is a Baleen whale. One of the larger rorqual species, adults range in length from 12-16 metres (40-50 ft) and weigh approximately 36,000 kilograms (79,000 lb). 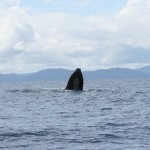 The humpback has a distinctive body shape, with unusually long pectoral fins and a knobbly head. 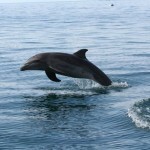 It is an acrobatic animal, often breaching and slapping the water. 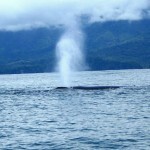 Males produce a complex whale song, which lasts for 10 to 20 minutes and is repeated for hours at a time. The purpose of the song is not yet clear, although it appears to have a role in mating. Found in oceans and seas around the world, humpback whales typically migrate up to 25,000 kilometers each year. Humpbacks migrate from the polar waters of South America between July and October and from the cold waters of North America to warmer tropical waters between the months of January and April. The whales come to the warm and quiet waters surrounding the Marino Ballena National Park, Caño Island, and Osa Peninsula area to give birth to their young. Like other large whales, the humpback was and is a target for the whaling industry. Due to over-hunting, its population fell by an estimated 90% before a whaling moratorium was introduced in 1966. 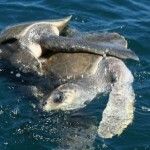 Stocks of the species have since partially recovered; however, entanglement in fishing gear, collisions with ships, and noise pollution also remain concerns. It is believed they number about 30,000-40,000 at present, or about 30-35% of the original population. The head of a humpback whale is broad and rounded when viewed from above, but slim in profile. The body is quite round, narrowing to a slender peduncle (tail stock). The top of the head and lower jaw have rounded, bump-like knobs, each containing at least one stiff hair. The purpose of these hairs is not known. There are between 20-50 ventral grooves which extend slightly beyond the navel. The body is black on the dorsal (upper) side, and black and white on the ventral (under) side. This color pattern extends to the flukes. When the humpback whale “sounds” (goes into a long or deep dive) it usually throws its flukes upward, exposing the black and white patterned underside. 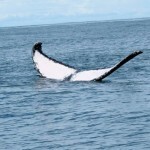 This pattern is distinctive to each whale. The flippers range from all white to all black dorsally, but are usually white ventrally. Humpback whales feed on krill, small shrimp-like crustaceans, and various kinds of small fish. Each whale eats up to 1 and 1/2 tons (1,361 kg) of food a day. As a baleen whale, it has a series of 270-400 fringed overlapping plates hanging from each side of the upper jaw, where teeth might otherwise be located. These plates consist of a fingernail-like material called keratin that frays out into fine hairs on the ends inside the mouth near the tongue. The plates are black and measure about 30 inches (76 cm) in length. During feeding, large volumes of water and food can be taken into the mouth because the pleated grooves in the throat expand. As the mouth closes water is expelled through the baleen plates, which trap the food on the inside near the tongue to be swallowed. Humpback whales reach sexual maturity at 6-10 years of age or when males reach the length of 35 feet (11.6 m) and females reach 40 feet (12 m). Each female typically bears a calf every 2-3 years and the gestation period is 12 months. A humpback whale calf is between 10-15 feet (3-4.5 m) long at birth, and weighs up to 1 ton (907 kg). It nurses frequently on the mother’s rich milk, which has a 45% to 60% fat content. The calf is weaned to solid food when it is about a year old. Found in all the world’s oceans, most populations of humpback whales follow a regular migration route, summering in temperate and polar waters for feeding, and wintering in tropical waters for mating and calving. In the Arabian Sea, a year-round non-migratory population of humpbacks appears not to follow this general rule. At least 3 different species of barnacles are commonly found on both the flippers and the body of the humpback whale. It is also home for a species of whale lice, Cyamus bops. 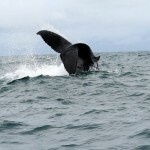 Humpback whales are active, acrobatic whales. They can throw themselves completely out of the water (breaching), and swim on their backs with both flippers in the air. They also engage in “tail lobbing” (raising their huge flukes out of the water and then slapping it on the surface) and “flipper slapping” (using their flippers to slap the water). It is possible that these behaviors are important in communication between humpbacks. Perhaps the most interesting behavior of humpback whales is their “singing.” Scientists have discovered that humpback whales sing long, complex “songs”. Whales in the North American Atlantic population sing the same song, and all the whales in the North American Pacific population sing the same song. However, the songs of each of these populations and of those in other areas of the world are uniquely different. A typical song lasts from 10-20 minutes, is repeated continuously for hours at a time, and changes gradually from year to year. Singing whales are males, and the songs may be a part of mating behavior. Because their feeding, mating, and calving grounds are close to shore and because they are slow swimmers, the humpback whales were an easy target for early whalers. The International Whaling Commission (IWC) gave them worldwide protection status in 1966, but there were large illegal kills by the Soviets until the 1970’s. 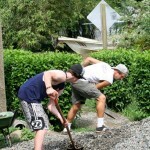 It is believed they number about 30,000-40,000 at present, or about 30-35% of the original population. About 2/3 of the way back on the body is an irregularly shaped dorsal (top) fin. Its flippers are very long, between 1/4 and 1/3 the length of its body, and have large knobs on the leading edge. The flukes (tail), which can be 18 feet (5.5 m) wide, is serrated and pointed at the tips. Adult males measure 40-48 feet (12.2-14.6 m), adult females measure 45-50 feet (13.7-15.2 m). They weigh 25 to 40 tons (22,680-36,287 kg). *Adapted from American Cetacean Society for educational purposes.